The forecast hasn't changed much, the predicted stormy weather is still for Friday evening and lasting almost all of next week, with strong wind and some rain coming up. It's time to say 'Goodbye to June 2015 '. We're on the last day of this month and I always use this to have a brief look back at the weather and other events during this month that we're about to leave behind us. It was not a great June version, we had lots of overcast and regular tropical showers. Similar to the last three years as you can find in my archives. We also had sunny days, but not too many, yesterday was a great example though with nice blue skies. The beginning of the month saw me in Moalboal in the Philippines for a PADI IDC and upon returning home I immediately took off for Phuket to run for the 4th time the Laguna Phuket Marathon, I ran the half marathon there. The same day it was back to Samui and I pretty much started another PADI IDC but this time on home ground, on Koh Samui. Right now I'm in the middle of Instructor Specialty training and we should be able to wrap this up by tomorrow. Last Friday I injured my leg with a pull in my calf and running will unfortunately be sidelined for a few weeks. Sadly I will miss out on a few races at the mainland because of the injury. My leg is doing better already, it will however take some time for the muscle to heal. It looks like all of July I will be at home on Koh Samui, a good to spend time with the family. The forecast remained steady for the time being, as of Thursday the wind will pick up and as of next weekend we may have storm like wind conditions and lots of rain for at least five days. We will keep an eye out for this and see if this soup will be really so hot when it's served. The landing and take off strip at Koh Samui airport. There's a dust road going around this strip, which is a shortcut from the Bang Rak beach road to the former departure/arrival area of the airport. The forecast is looking good until Thursday when besides cloud cover, the wind is picking up and come next Sunday we might have a full blown storm with very strong wind and lots of rain. We will keep an eye out on this storm that's brewing up and see how this will develop. The forecast changed a little bit, cloud cover is predicted except possibly for mid next week and next weekend looks like a storm is moving this way, so we will keep an eye out on this and see how that develops. The forecast predicts more cloudy days and skies to come until Tuesday through Thursday when it may clear up, just to be followed by another batch of strong wind and an occasional shower. The forecast has changed drastically, all hard wind for the next seven days has evaporated overnight only to supposedly come back next Thursday. There might be some rain today and tomorrow. The forecast keeps changing almost daily but the general idea is that we will be seeing a strong wind over the next ten days with occasional showers. Each day the strengths of the wind seems to shift between days. Now it looks like the end of next week will be stormy, but I'm sure that may change again once we get closer to said time. The location of the spirit houses between Chaweng and Lamai at the viewpoint is growing with more spirit houses being brought by people. It's noisy there, passing cars and motorbikes tend to honk the horn! The forecast changes by the day. In general it will remain mostly cloudy with some strong wind and this wind will vary in strength each day have an impact on boat traffic. The forecast has eased up a little bit, the predicted storms seem to have lay their heads down but there's still a strong wind coming this way and especially Friday and Saturday may see some hard wind. The tropical showers are also still around and may occur at any time of the day. The forecast is not looking good for next week, strong wind is predicted for the next ten days with Thursday afternoon into Saturday night reaching a peak. It will rain at occasion but in general it looks surprisingly dry, well, at least to the forecast. It's grey, cloudy and wet around Koh Samui and it's just getting dry after we had some heavy morning rain. Current temp at 8am is just 23C, nice and cool! Today's update is an hour late because my Koh Samui PADI IDC candidates are starting a PADI IE (Instructor Exam) today and I was busy. The forecast is looking worse each day, this morning we see an increase of wind over next week, Wednesday and Thursday particularly look like they may have some stormy weather. Expect the fishing boats to come inside the Samui bays next week and also expect a fair amount of rain. The forecast looks worse as of this morning, with even stronger wind next week between Tuesday and Friday. Come next weekend the wind should disappear but there's always the chance of encountering a tropical shower. The forecast has changed again, the nice and easy weather predicted yesterday is gone and we can be facing some hard wind and rain again after the weekend. fairly cloudy skies and tropical showers are very likely. The forecast predicts hard win and some rain later during the afternoon and evening and come Friday it should be less cloudy, Chances of tropical showers are still abound all the time throughout June. The forecast predicts overcast for the next ten days with some very strong wind this afternoon and all day tomorrow accompanied by rain. The rest of the ten day period should be seeing less rain but still with the option of a tropical shower here and there. Food stands at the Sunday BBQ dinner on the beach at Four Seasons Koh Samui, which we attended yesterday and it was very delicious. The forecast predicts heavy cloud cover for the next ten days with the wind picking up and reaching it's peak this Wednesday. By Friday the wind should have eased completely again and besides today, where rain is predicted, chances of the typical June tropical showers should be rather slim. The current PADI IDC for June on Koh Samui has reached the half way mark today. The forecast predicts cloudy skies until next Sunday with a strong wind, peaking on Thursday and hopefully after the weekend it starts to become sunnier again. Chances of a tropical shower are always an option in June but according to today's forecast are not that likely, in contrast to yesterday's forecast. It changes and fluctuates all the time. The forecast predicts heavy cloud cover for the next ten days with a few showers between tomorrow and Tuesday and the wind is picking up with a very strong wind from Wednesday through Friday. The current June PADI IDC on Koh Samui is now in it's third day and in full swing! The forecast predicts mostly cloudy skies and rain tomorrow and Monday, with tropical showers always being an option during this month. There a tiny bit of rain on some parts of the island, but where I was it remained dry all day long. The forecast predicts heavier could cover, especially starting over the weekend with more chances of tropical showers. The forecast predicts mostly cloudy skies for the next ten days with plenty of chances of tropical showers. The forecast fluctuates little bits, it's mostly overcast for the next ten days with occasional tropical showers being an option at most days. The forecast does predict rain today and cloudy skies for the next ten days with some hard rain supposedly next Tuesday and Wednesday. The reason for the late update is my participation in the 10th Phuket Laguna Marathon where I ran the half marathon. My 3rd best time ever to date in half marathon but ti was very tough, hot and humid, not an easy race at all. I finished in 1:56'57.9 with a 5'32 pace. Not bad considering my preparation was not the best at all, with all the travelling I did over last week. Since I just got back from a trip in the Philippines, with two night in Manila, here's a Food on wheels; Manila food carts addition to the Food on Wheels series. First a general update and a bit of personal observation; the majority of the Philippine population seems to be a poorer compared to the average Thai population. 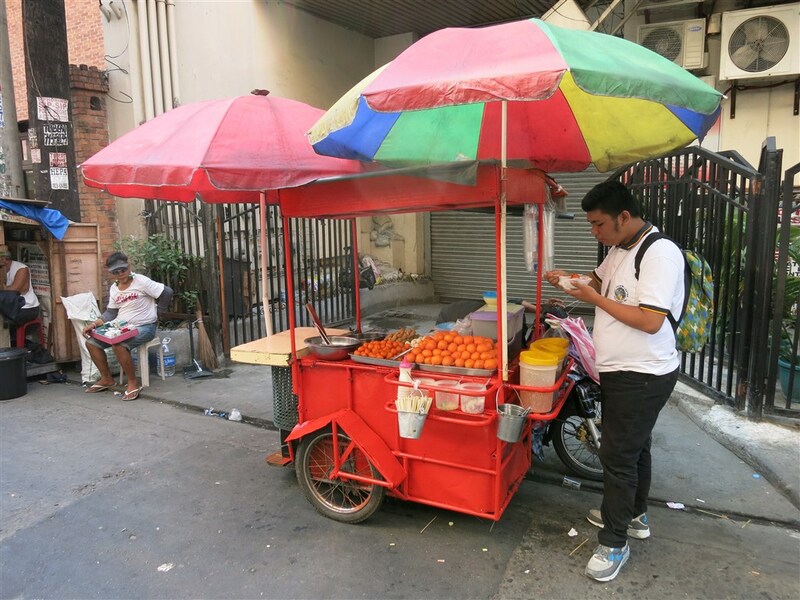 The food on wheels in Manila was merely push carts or bicycle carts but not that many carts with a motorbike, which is common in Thailand. The pictures I took in the Ermita area of the Philippine metropolis clearly show this. 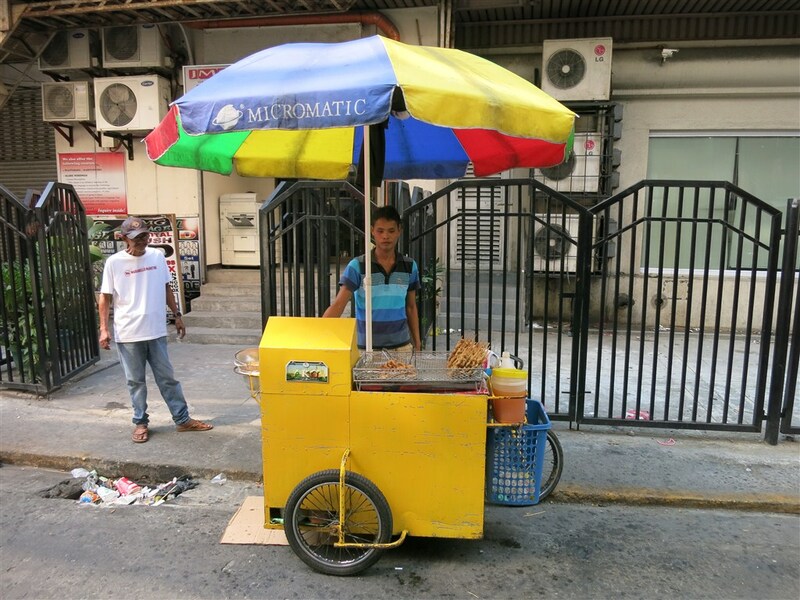 There's only one motorized vehicle in these pictures and hat's what the average in Manila probably is. Above and below you can see samples of bicycle carts, a common sight in the Philippines. 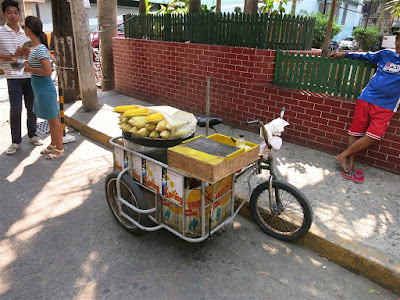 On the other hand, there were tons of small carts all over the place, selling local goodies or more familiar goods, like fruits or as can be seen above, corn on a stick. 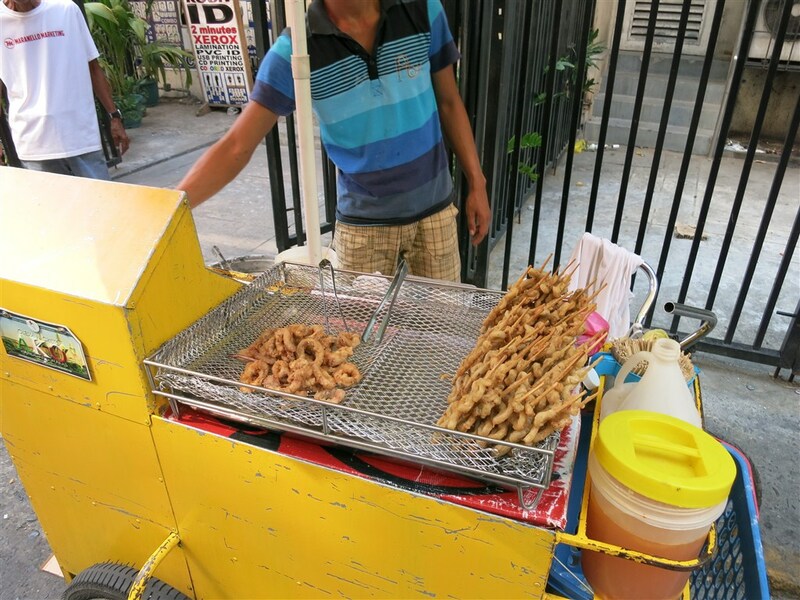 There's a wide variety of food on offer in the streets of Manila. 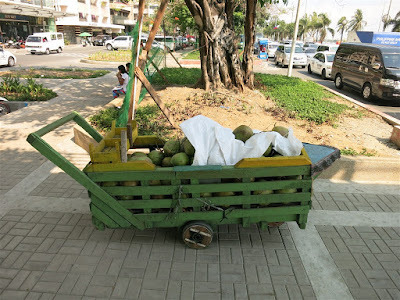 This pushcart pictured above was loaded with coconuts, very refreshing in the dirty, hot and busy streets of the metropolis. In Tagalog (the official Philippine language), they also have 'buko', which is coconut juice, also very nice and refreshing. 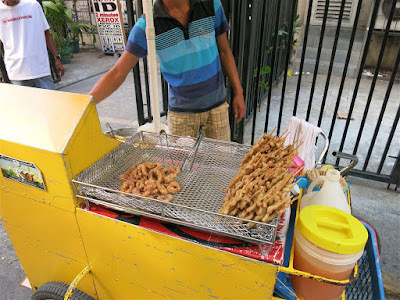 Hope you enjoyed this addition to my 'Food on Wheels' series, an international addition this week, which shows once more the variety and ingenuity of the local population(s) to adapt to the local circumstances and keep this Asian street food scene going. It's good to be back home again, but I will make my way to Phuket this morning, for my 4th participation in the half marathon of the by now 10th Phuket Laguna Marathon. Here I ran my first half marathon, tomorrow will be my 11th in a race setting. The forecast shows an increase in cloudy skies over the next ten days with still the possibility of an occasional tropical showers. The reason I stayed in Manila for two nights was a PADI Instructor Development Update, which I attended yesterday at the Intercontinental Hotel in Makati. The forecast predicts fairly sunny skies with an exception from Sunday through Tuesday when we may see some more clouds and possibly some rain, especially Sunday to Monday night. The forecast is looking good for the next ten days. In general it's sunny but some days may b a bit more cloudier and the occasional tropical shower is always an option throughout June. This morning I find myself back at Dumaguete airport, which is actually near Sibulan in the Philippines, waiting for a flight to Manila, where I will stay for two nights and than it's off, back home to Samui again. Current temp at 8am local time is 28C under a cloudy sky. Yesterday my candidates were successful at the Dauin PADI IE and both passed all exams. The forecast didn't change much, for the next ten days maybe a few more clouds each day but there should be enough sun for sun lovers to be happy but be aware of the chance for tropical showers around the island. It's a late update, due to bad internet connection down here in Dauin in the Philippines but we are enjoying a nice blue sky here with a current temp at 11am local time of 32.5C and a light breeze to keep it cool. The forecast for Samui island is looking fairly good. Some cloud cover is drifting in and out over the island and chances of tropical showers are becoming less. It's a warm 'Welcome to June 2015'. 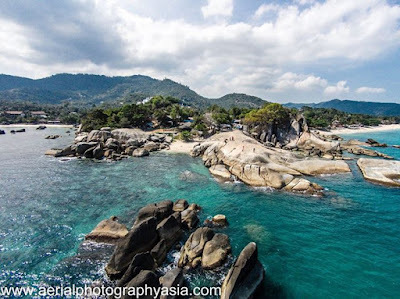 The beginning of a new month and a typical June on Koh Samui will see a fairly nice month which should give you enough sunshine, despite a monsoon or rainy season going on in parts of Thailand. 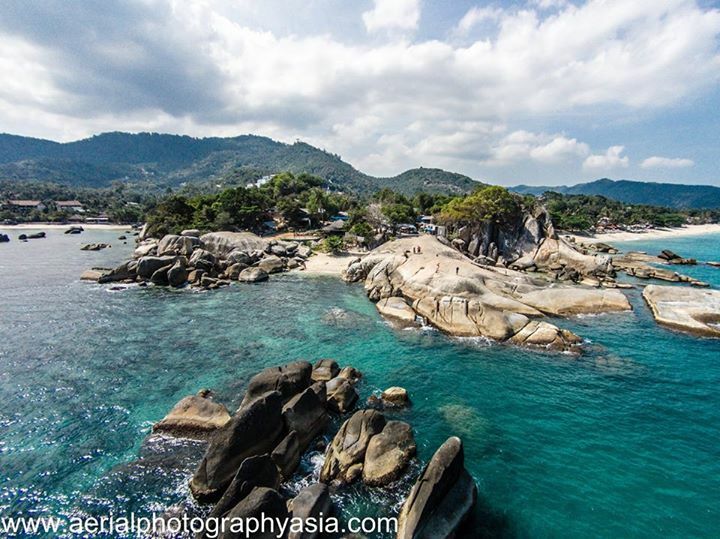 Koh Samui is however outside of the main rainy season area, you may get some tropical showers throughout the month though. Like last year, I should be home for the duration of this month, except for the week. Next Sunday, 7th June, I will run for the 4th time the Phuket Laguna half marathon, almost immediately followed by a PADI IDC on Koh Samui, starting 10th June. The forecast predicts mainly blue skies with some partial cloud cover except for Wednesday and Thursday morning, where there may be heavy clouds and showers. All other days you may experience a tropical shower.